Sportif judo is, and always has been committed to providing players and young athletes with the best possible opportunities to succeed in judo. We achieve that through the Sportif Talent and Performance programme. The Talent and Performance programme provides a structured pathway and has a proven track record which has produced Commonwealth, European and World medallists, as well as Olympic Team members. Every great journey starts with just one step on to the mat. 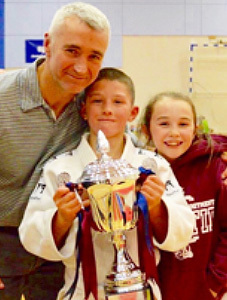 At Sportif Judo we have a structured coaching system and philosophy for all age groups, abilities and motivations. In the beginning children should simply enjoy being on the mat, learning fundamental movements and the skills of judo, meeting new friends, building self-confidence, self-discipline and learning how to listen and work together with other children. Children and adults will have the opportunity to take part in technical gradings to achieve their different coloured belts from white to black. As individual players progress some may wish to train more and take part in club tournaments. It is at this stage that motivated players are invited to a Talent identification day and offered a 6 week trial in the Rookies Team which is the first rung of the Sportif Talent Programme. In the Rookies programme players will be asked to train twice a week and will have the opportunity to compete in regional competitions and take part in special training camps with indoor and fun outdoor team building activities. Step 3 on the Sportif Talent Programme pathway is where players make the transition from player to young athlete. At this stage selected athletes maybe invited into a structured strength and conditioning programme and begin to train with the National Team and compete nationally and internationally. Recognise the girl with the GB kit? Look again at the “Enjoy Judo” image. 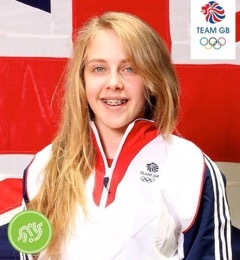 Yes that’s Imogen Walls the smiling little girl now Team GB member. 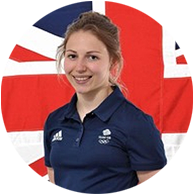 The final step in the Beginner to Olympian Pathway is when our young athletes move from the Sportif programme into the Team GB fulltime athlete programme. The friendships and bonds created in the club remain as strong as ever when our athletes move onto the Team GB programme. Sportif continue to offer support and advice. Bonds and friendships forged over many years, victories and defeats. We call it the Sportif family……….